We're starting off Bunny Week 2016 with a bunny lunch! 1. Make a sandwich. We made peanut butter with raspberry preserves. Yum! Use the biscuit cutter to cut a circle from the sandwich, then use the knife to cut two matching ears from the scraps. Arrange them on the left side of the plate. 2. Cut one raisin into three small bits. Arrange them on the bunny's face to make eyes and a nose. 3. Cut thin strips of carrot to make the whiskers and place them next to the nose. 4. Make the the tree by placing a pretzel rod on the plate and arranging broccoli crowns around the top. Dice an apple slice and put the bits amongst the broccoli. 5. Place edamame at the base of the tree. A fitting allegory for motherhood? To be clear, both the attractive version of Bunny Lunch and the plate of scraps are intended for humans, though there are items that can be shared with a rabbit. Your rabbit can have very small amounts of the broccoli, apple, carrot, and raisin. A rabbit should never have a sandwich or pretzels. As for edamame, some say fresh soybeans are rabbit-safe, but not cooked, dried, salted or otherwise processed. Visit the House Rabbit Society website for an excellent list of rabbit-safe foods. Loveeeeeeeeee that lunch! How COOL!!!!!!!!!!!!!!!!!!!!!!!!!!! So cute! 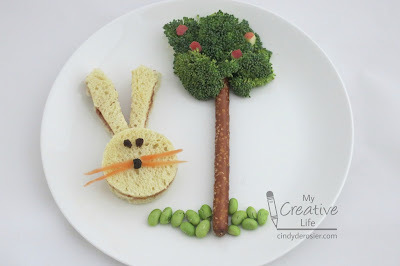 Your bunny lunch is adorable!!! And I loved learning how a rabbit can share in parts of the bunny lunch scraps!! Hmm...I wonder if i presented broccoli like that, it would be more popular at my house?